There are five new pretty pastel shades from the Avon True Colour Range launched in Brochure 4 (UK). Four crème shades and one shimmer, and it’s the shimmer one I’m going to review. As soon as I got Tranquility out of the box I knew it was going on straight away! 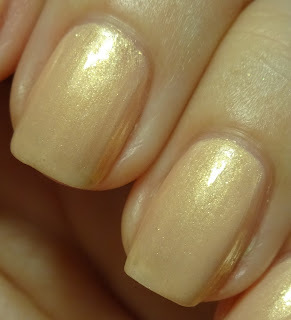 Tranquility is a unique shade, a soft creamy peach with fabulous gold shimmer. Soft, delicate, elegant and mesmerising. A perfect summer shade and bridal/bridesmaid shade. The photo below is without camera flash under artificial lighting, gorgeous, gorgeous, GORGEOUS! At only £3 a bottle AND a free nail file in C4, why not treat yourself to a bottle or 2 or 3….